Before a girl circumnavigated fairyland, before John fell in love with Hagia, before six super- heroines discussed their stories in the afterlife, and long before Space Opera, Catherynne Valente was taking the poetry and dreamyness of folklore and turning it inside out to show you the shiny bits you hadn’t known were there. 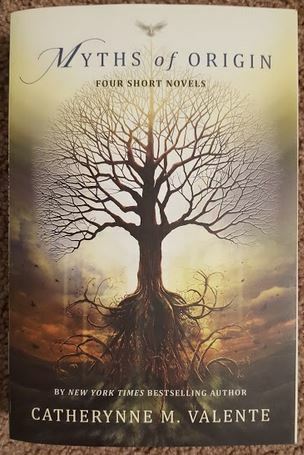 Valente’s novella, The Grass-Cutting Sword, was published in 2006, and if you come across a copy in some used bookstore somewhere, BUY IT. (or even better, find a copy of Myths of Origin, which includes even more of Valente’s early work!) Especially if you like folklore. Especially if you like beautiful / weird / strange writing. If you enjoy C.S.E Cooney or Benjanun Sriduangkaew, you’ll love this. 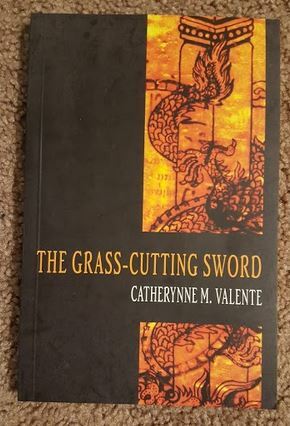 In the story notes in Myths of Origin, Valente describes The Grass-Cutting Sword as “probably the most textually experimental and angriest” of her work. Yes, it is very experimental! But none of the characters seem overly angry. Driven? Absolutely. Tragic? That too. Oh, and as with all good fairy tales, there is a dragon and there is a sword. The Grass-Cutting Sword is a retelling of the Japanese folktale of how the storm god Susanoo was banished from heaven by his sister Ama-Terasu. Instead of viewing it as a banishment, he takes the opportunity to seek his mother in her underground realm. Recognized as a god by a worshipful man and woman, he undertakes the quest to save their recently abducted youngest daughter from an eight-headed serpent which has eaten the other seven daughters. If he succeeds in the quest he has undertaken, the parents have promised him he can marry their youngest daughter as soon as he rescues her. Her parents say she is the most beautiful girl in the world, fit for an Emperor! And Susanoo wouldn’t be so insulting as to disagree, now would he? The narrative flips back and forth between Susanoo’s point of view, and the serpent’s point of view. Susanoo doesn’t mind hunting down the serpent, he’s not quite sure what else (other than look for the entrance to his mother’s realm) he’s supposed to do on Earth anyways. As he travels the countryside looking for signs of the serpent, he tells the reader the story of creation – how his parents lived on an island surrounded by jellyfish, how his mother created the islands of Japan, how her fiery child was the last she would give birth to. Susanoo tells of his own creation, and that of his sister Ama-Terasu and his brother Tsuki-Yomi. 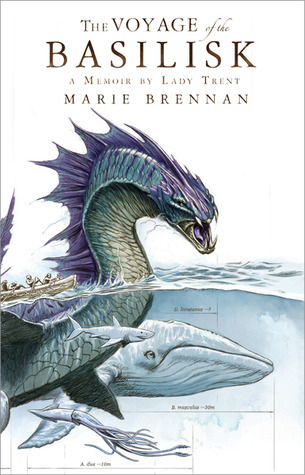 Voyage of the Basilisk is the third book in Marie Brennan’s “Lady Trent” series. If you’re just joining us, I suggest skimming or skipping this review, as there are unavoidable spoilers. But do take a look at my reviews for the earlier books in the series! For the last six years, Isabella Camherst has been second guessing some of her decisions in Eriga, allowing her townhouse to become a gathering place for the intelligentsia and curious, and raising her son Jake. She pours over research and samples, trying to understand how to categorize the known species of dragons. There is quite a bit of talk of what makes something a dragon, or simply a reptile (if Pluto is a planet, why is this larger thing not a planet?). Is it the extraordinary breath? having wings? having a bird-like bone structure? Are sea serpents not quite dragons since they don’t have wings, or even legs? She’ll simply have to study them more! Her plans come to fruition, and along with Jake and his governess, and fellow researcher Tom Wilker, she finds herself on the Royal Ship Basilisk, which is captained by Dione Aekinitos, known as the mad Captain. Tiny quarters will be their home for at least the next year, but who cares? Isabella and Tom will have the chance to study sea serpents, fire lizards, and other species the most Anthiopians have only ever heard about second or third hand. Part of her funding has come from a local society, so part of her letters home include dispatches, essays, and researches to be published publicly. Of course, things do not go as planned. She does see sea serpents. and fire lizards. And meets a handsome and engaging archeologist. And has a secret marriage. And there are politics and pirates and volcanoes. And references to Linear A, the Rosetta Stone, and how to translate untranslatable languages. And like in the first two books, there is much in the way of Isabelle the elder taking pains to “set the story straight”, and to make sure the reader knows that when she was traveling she had no way of knowing what people were saying or doing back home.